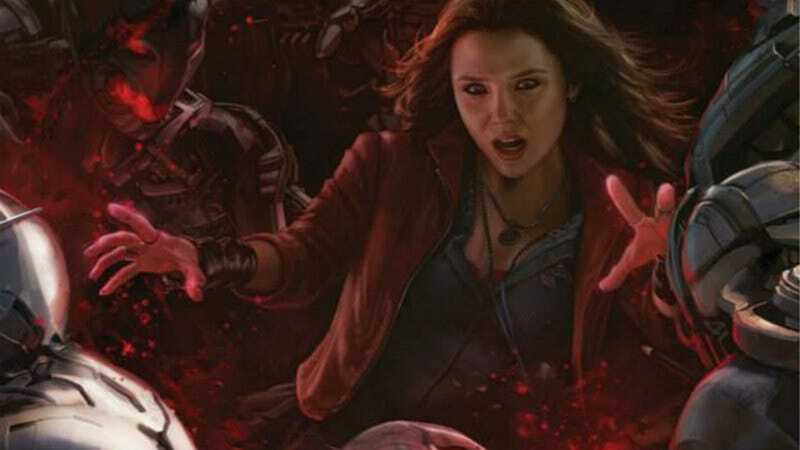 For those of you chomping at the bit to see Avengers: Age Of Ultron and find out if Joss Whedon is going to kill your favorite character, well (spoiler) if your favorite character is Scarlet Witch, you can rest assured that she survives. Recently, Whedon and Elizabeth Olsen—who portrays Wanda Maximoff, otherwise known as the Scarlet Witch—spoke at a Meet the Filmmakers Q&A at the Apple Store in London. There, Olsen defied Marvel executives (and the Hydra members controlling them) by announcing that her character will appear in Captain America: Civil War. Actually, what she said was, “I guess I’m allowed to talk about that now.” But Marvel still hasn’t announced her involvement in anything beyond Avengers, and most people haven’t yet seen Age Of Ultron to confirm that she isn’t randomly impaled by a spike just when the heroes seem to be out of danger. When she shared the news in the middle of the Apple Store—where there were plenty of computers nearby for everyone to share it—Whedon probably leaned in and whispered, “You just signed your own death warrant.” Of course, that’s a lie. Whedon most likely doesn’t have clearance to kill any of the major Marvel characters (or the actors playing them), since they’re all scheduled to appear in either their own franchise or someone else’s at some point. This might be one of the reasons why Whedon is leaving the Marvel universe to create his own, where the blood of fan favorites will flow like wine. Captain America: Civil War will be directed by Joe and Anthony Russo, two nice guys who only pretend to kill characters for one act or so. The film is set for release on May 6, 2016.